April 22, 1993: Mosaic Browser Lights Up Web With Color, Creativity. Quite a title from a Wired Article. I was a graduate student in Library Science at the University of Illinois at Urbana-Champaign when the NCSA(also at UIUC) Mosaic browser was added to the computer lab. I remember looking up chocolate, and a photo appearing of cacao pods, in color, inline on the same page. The links to other pages were in underlined in light blue. You could just click on them instead of typing things into the command line. I didn’t understand how profoundly this would change my experience as a librarian. Web pages aspired to look like magazine or book pages and they eventually did. When I graduated, the Mosaic Browser was not yet everywhere. As a librarian, I was the mediator, the travel agent of information, because library patrons couldn’t get to all of it themselves. Slowly the browsers encompassed more and more of my job. And in 2003, I discovered another form of Mosaic: the art form, while on a silent retreat at the Wernersville Jesuit Center, in the chapel with a mosaic mural designed by Hildreth Meière. As I learned to make mosaics, and started Nutmeg Designs in 2007, the Mosaic Browser had ceded to Google, and my librarian job ceded as well in 2010. 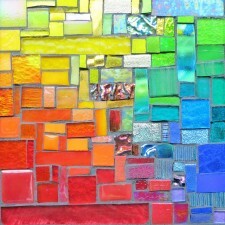 Mosaic is everywhere as a metaphor, as a name for companies, software, apps, training programs. Canada, where I grew up, favors the Cultural Mosaic metaphor vs the US Melting Pot metaphor. Stratoz teaches science and horticulture, so he knows about the mosaic virus causing a mottled pattern on plants. It can be frustrating to have a focus on mosaic art and wade through the 69 million results on Google, though I did come across Mosaic Records, restorer of jazz albums, which reminds me of the serendipity that comes with web browsing. The Mosaic Records Jazz Gazette clued me into another anniversary this month, the 75th of the premiere of Duke Ellington’s Black Brown and Beige jazz symphony. Take a jazz break with Come Sunday from the 1958 recording with Mahalia Jackson, and then a coloring break with the National Center for Supercomputing Applications 30th Anniversary Coloring Book.